Parents and people with poor hand-eye coordination know very well the worst problem with ordinary trash cans: they require the trash to be taken to them. 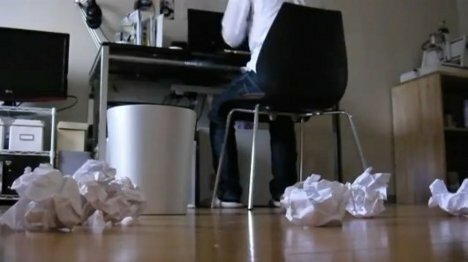 A Japanese inventor known as FRP invented what he calls the “Smart Trashbox,” a waste basket that senses where your trash has been thrown and then positions itself under the flying piece of garbage to safely catch it. Not surprisingly, the device uses a Kinect sensor to “see” and track the trash. The sensor predicts where the trash will land and then instantly directs the wheeled trash can to position itself in that spot. The tossed garbage lands in the can and your pad stays a little neater. FRP is working on improving the can’s accuracy, and he may eventually license the idea for commercial production…which means that eventually, we could all forget about the hassle of getting up and walking over to the trash can.